Nearly 400 children in Malaysia are diagnosed with blood cancer every year, with the most frequent type being acute lymphoblastic leukaemia (ALL). One in 2,000 children aged below 15 years will be diagnosed with ALL in their lifetime. Cancer is now the leading cause of death in children and adolescents in most developed countries. No one knows why children develop cancer, but recent studies in childhood ALL have generated interesting findings. For example, cells carrying leukaemia-specific genetic changes are seen in one in 100 cord blood samples from healthy newborns. This suggests that the “seed” to develop ALL begins while the child is still in the mother’s womb. Abnormalities in some genes can increase a child’s risk of developing leukaemia. Yet, unlike Angelina Jolie, who inherited a faulty cancer gene from her mother (giving her an 80% chance of getting breast or ovarian cancer), 98% of children with ALL do not have an inherited risk for leukaemia and do not later pass the risk to their offspring. Unlike many adult malignancies that result from habits such as smoking or poor diet, the cause of childhood cancer is largely unknown. Interestingly, infection has been linked to the development of leukaemia. One hypothesis postulates that repeated early exposure to common viruses, usually from attending daycare facilities, protects against childhood leukaemia. Strangely, late exposure to infections, i.e. after the age of two years, increases the risk of ALL. In truth, there is no single way to prevent childhood cancer. However, the good news is that survival rates for children with cancer has improved tremendously over the last 50 years. From a disease considered invariably fatal in the late 1960s, 85% of children with ALL are cured in most developed countries today. But how has the story been for children in Malaysia? In the 1970s, survival of children with ALL treated at the University of Malaya Medical Centre, one of the two centres providing childhood cancer care in the country at that time, was only 40%. Protocols utilising intensive chemotherapy and radiation to the brain improved the survival rate to 56% in the mid-1980s. Although more patients were cured, there were significant long-term side effects. The philosophy then was to deliver more intensive therapies to increase survival. In 2002, a joint effort between the doctors of the University of Malaya (UM) and the National University of Singapore led to the founding of the Malaysia-Singapore (Ma-Spore) Leukaemia Study Group. This brought together leading investigators from Malaysia and Singapore to tackle the problem of how to better treat ALL. 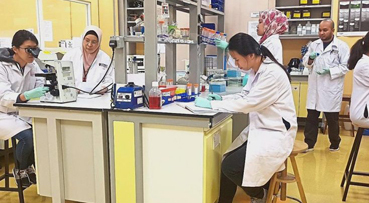 The first collaborative clinical trial, called the Ma-Spore ALL 2003 protocol, incorporated specialised laboratory tests, which were previously unavailable in Malaysia, enabling risk-adapted therapy to be administered. While most of the world used biomarkers to give more therapy with little gain, the Ma-Spore group focused on choosing the best patients and giving them less therapy. When the trial closed in 2010, 556 children had been treated and overall survival had significantly improved to 81% – a landmark achievement for both countries. Modern therapies have also elevated survival rates to 75%-80% for children with various other cancers such as Wilms’ tumour, lymphoma and hepatoblastoma. However, these stellar achievements have come at a price. Many childhood cancer patients survive decades after completing treatment, but develop chronic health conditions earlier than their peers. A phenomenon of accelerated ageing in these survivors with co-morbidities such as cardiovascular disease, diabetes mellitus and frailty in their early 40s, is particularly striking. Our own studies on childhood cancer survivors have revealed similar concerns. In a multi-ethnic Malaysian cohort of 101 long-term childhood cancer survivors followed up for 20 years or more at UM, we found that these young adults had evidence of cellular ageing similar to individuals three decades older. One in five of our survivors had already developed overt metabolic syndrome, whereas 50% demonstrated one or more abnormal metabolic parameters, such as hypertension, dyslipidaemia or elevated blood glucose. While a high survival rate is the aim and source of pride for every paediatric oncologist, an ever-increasing pool of young adult childhood cancer survivors with debilitating chronic co-morbidities necessitates serious reconsiderations of treatment philosophy. Clearly, a “one-size-fits-all” business-like approach for childhood leukaemia therapy where survival percentage is the sole yardstick of success is no longer acceptable. One of the key mitigation strategies is to improve how these children are treated; specifically, ensuring chemotherapy protocols are tweaked to be as personalised as possible to minimise long-term organ toxicities to a feasible extent. Radiotherapy to the brain, once a standard component of childhood leukaemia therapy to prevent relapse, has been replaced by the chemotherapy drug methotrexate, which is given into the veins, as well as into the spinal fluid. This spares the immature brain from radiation-associated late effects such as growth failure and drop in IQ. Our current leukaemia trial, the Ma-Spore ALL 2010 protocol, which to date has recruited approximately 450 children, takes this one step further by excluding preventative brain irradiation altogether. Additionally, children with low-risk ALL no longer receive any drugs that can cause their heart to fail. One in five children with ALL has a loss of the Ikaros gene in their leukaemia cells. The Ikaros gene controls the maturation of the normal B-cell. When lost, the leukaemia cells cannot mature and divide uncontrollably. Those patients with Ikaros gene deletion have a 30% chance of relapse, double that of usual patients. In the Ma-Spore ALL 2010 trial, more intensive therapy is given to this group of higher-risk patients, resulting in a reduction in relapse risk to 13%. The Ma-Spore group is the first in the world to show that appropriately escalated therapy for Ikaros gene-deleted patients improves survival. This discovery was recently published in the prestigious Journal of Clinical Oncology. One of the cross benefits of the Malaysia-Singapore collaboration has been the establishment of the UM Paediatric Oncology Research Laboratory; now in its 15th year of existence. This facility, funded by a combination of charitable donations and research grants, provides the necessary laboratory support to advance collaborative clinical trials and serves as the research hub for the paediatric haemototology-oncology unit, whose main remit is to deliver high-quality therapies for Malaysian children with various malignancies. The singular objective of curing a child with cancer at all costs is no longer adequate. Today, we must look beyond merely searching for new cures, but instead ensure that a cure also means healthy adult lives for our children who survive cancer. To this end, the Ma-Spore Group aims to continuously develop therapies for blood cancer that are not only effective, but also, more importantly, personalised, and hence, safer. In the spirit of “Malaysia Boleh!”, we can help the world to better treat childhood leukaemia as the two innovative achievements of the Ma-Spore group have shown. All our children deserve the best care that we can provide.